The average English speaker knows countless words-almost 25 times more than there are stars visible in the night sky. This book, Read Write Right uncovers the often surprising mistakes that one commits while speaking and writing. In over hundreds of entries, the book reveals the COMMON ERRORS that are not at all UNCOMMON in usage. The sentences are simple but the errors are glaring. The purpose of this book is to bring out and make explicit these errors that we seem to make when we speak and write. 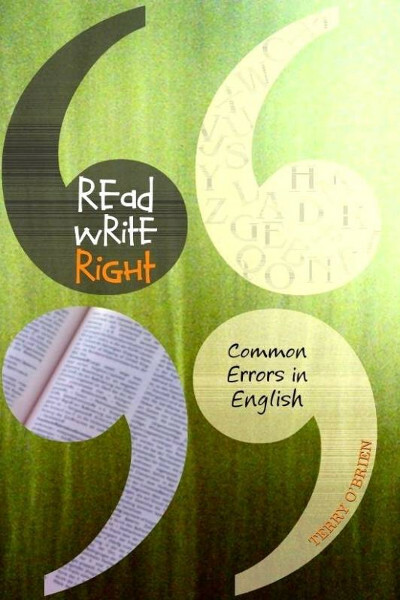 Written in clear and informative style, Read Write Right shows how today English has developed yet a staggering numbers of common errors that are intermingled in the usage. This is a book meant for one and all-students, professionals, journalists, writers, public speakers, publishers and one who walks the talk! Terry O’Brien is an academician by vocation and a passionate quiz enthusiast by avocation. His leit-motif is the igniting of quizzing instinct and an aptitude to develop the 3rs of learning – Read. Record. Recall. He is a Trainers Trainer and a motivational speaker. He has written several books. His flair for writing and speaking come naturally to him. This book will be shipped in 2 days. The time taken for you to receive it will depend upon the mode you choose, while completing your purchase. The rates applicable for each mode are different. You will be informed after the order is shipped. Shipping costs depend on the mode chosen, the weight of the item, and the distance it will travel to reach its destination. Shipping costs will be charged depending on the weight of the entire purchase (if more than one item is purchased). The same shipping mode will apply to all products in such a case.